While we have temporarily closed the Early Intuitives gallery, to facilitate the next phase of the re-installation of our permanent collection, we present a post on one of the three artists featured in that gallery, John Dunkley (the others are David Miller Senior and Junior). The first part of this post is excerpted from what his widow Cassie Dunkley wrote in 1948, on the first anniversary of her husband’s death, when a commemorative exhibition was held at the Institute of Jamaica. It narrates Dunkley’s early and obviously quite adventurous life as a young Jamaican migrant worker and sailor, followed by his years in Kingston as a struggling artist. The the second part is adapted from a biographical entry written for the Dictionary of Black Artists by NGJ Chief Curator, Dr. David Boxer. John Dunkley was born in Savanna-la-Mar on December 10, 1891 and died in Kingston on February 17, 1947. “His father, who was in Panama, sent for him so he travelled out. Unlucky for him his father died and was buried the day before he landed. Although he was deprived of his father’s wealth, Dunkley was not discouraged and started to earn a livelihood for himself. He travelled from Panama to Colon to Costa Rica, Chiriqui David and thence to Camaguey […] He started out for California to study dentistry when a revolution took place and he lost all of his belongings, money, clothing etc., only his life was spared. He ran for miles in woodland tearing off clothes and shoes until he was left in rags. He was lucky, as being a Free-Mason he was able to give the Mason’s distress sign and it was answered by a Mason on a passing ship and he was welcomed on board. […] He immediately signed on as a sailor and went travelling. He went to England, Scotland, North and South America and numerous other places. […] He went back to Chiriqui where he decided to settle down as a barber by trade. He worked hard at his barbering and in his spare time would do some painting on canvas and he got an insight of the art from Clarence Rock, who was the most prominent photographer in Panama. He kept on painting, giving the paintings to his friends and left quite a lot there. He returned to Jamaica in 1926 and settled down. He married Cassie Fraser and took life more seriously as he had responsibilities to meet. He was fortunate in his marriage as his wife stuck by him and they both lived happily together. […] He continued painting till one day as he sat alone in his barber shop [on Princess Street in Downtown Kingston] he was approached by a white gentleman who had been attracted by the small signs which made up the screen of his shop. This gentleman, who introduced himself as Mr. Delves Molesworth [then the Secretary of the Institute of Jamaica], exclaimed ‘At last I have discovered a hidden artist!’ Mr. Molesworth encouraged him to keep on painting as he knew that one day he would achieve his goal. […] Dunkley was a poor but respectable man. His life made him beloved by all who associated with him. […] His work was criticised by many who did not know his worth as he was the only imaginative painter in the island and one could not teach him as he was self-taught. John Dunkley’s output as a painter was small. 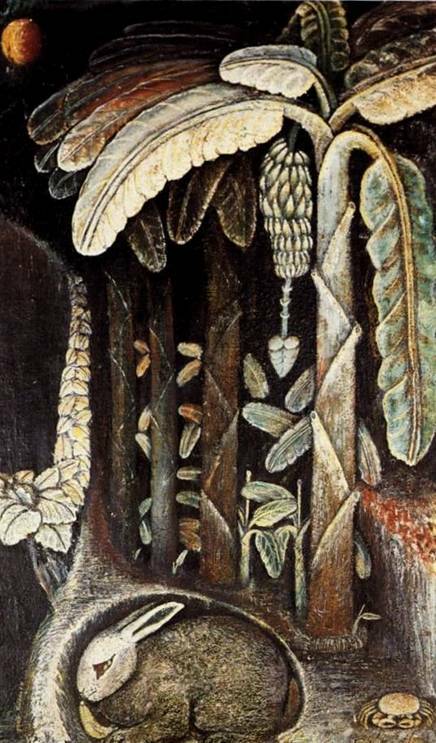 Less than fifty paintings are known, but they suffice to demonstrate a unique and compelling aesthetic allowing him to assume the rank of Jamaica’s greatest painter. His known oeuvre spans little more than a decade, and as he kept his works and continued to refine or overwork them, there is no clearly discernible development. Most of Dunkley’s paintings are landscapes: imagined landscapes that seem full of a decided hidden symbolism. Typically, the vegetation seems fantastic, trees or shrubs with overblown inflorescences are counter counterpointed by bare truncated branches, often depicted in a manner that encourages their reading as phallic symbols. Small animals; crabs, birds, a mongoose, a rabbit and often spiders negotiating complex webs, frequent these dark disturbing woodlands. Only rarely does a human figure intrude. Man is implied however in the occasional house seen in the distance or at the edge of the wood, but more so in what is surely Dunkley’s most persistent motif, the path or road that pushes through the vegetation often suggesting great depth. In his famous Back to Nature (c1939), the path bifurcates in the foreground to encircle a heart shaped grave. Footprints of the departed hauntingly trod the path. There is a distinct group which seem more more expansive, and these I suspect were his last works, Lonely Road, Springboard, Woman Feeding Fish, Footbridge where the accustomed claustrophobia, imparted by dense bracketing vegetation, gives way now to clearer skies, white now rather than grey and with far fewer elements within the landscape. In some of them the black outlines of a spare vegetation is silhouetted against the sky. 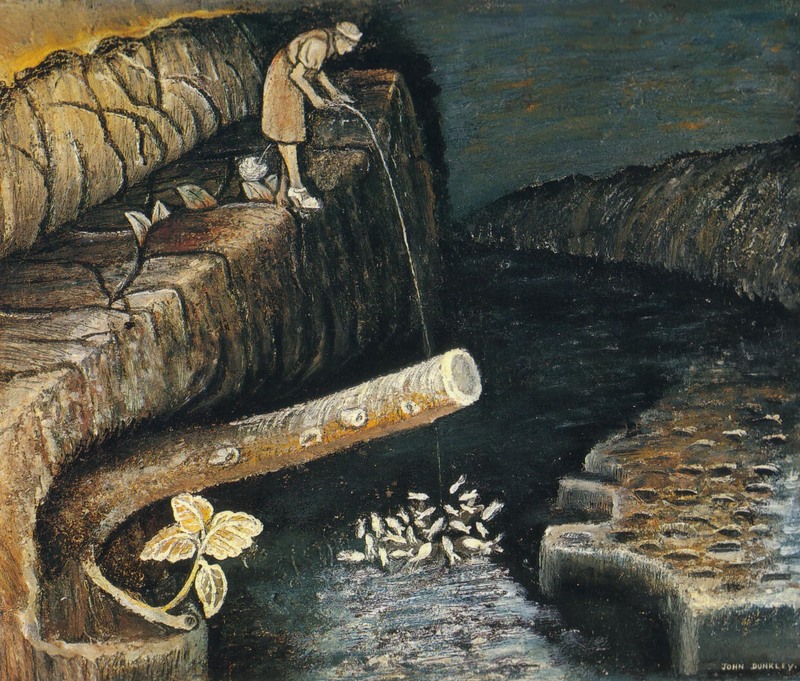 […] Unrealistic touches, like the isolated springboard in Springboard, seem out of context, the leaves pushing up between the cracks in Woman Feeding Fish, the unstable support of the bridge in Footbridge, contribute to the disquiet of these works. 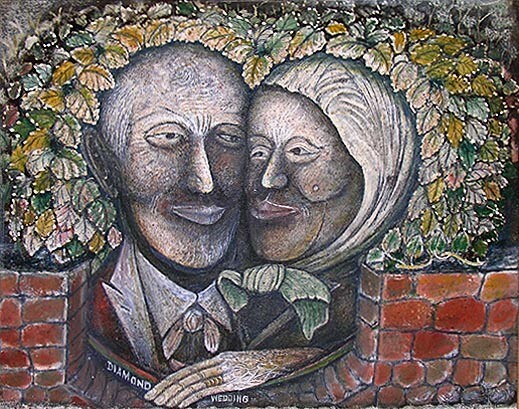 After a memorial exhibition in 1947 and a joint Dunkley/Daley exhibition in 1960 – both at the Institute of Jamaica – Dunkley was virtually a forgotten artist. With the resurrection of a fair percentage of his oeuvre in the National Gallery’s retrospective in 1977, with its accompanying illustrated catalogue, and the subsequent permanent display of a good representative collection of his work, Dunkley has regained his position in the public’s eye as a true Jamaican master. ← Season’s Greetings from the NGJ! Thorough piece, makes good reading! Wonderful – I hope you cover all the Intuitive artists in due course. Thanks, Annabella. The idea is to cover a wide range of Jamaican artists, including the Intuitives, and to build a public access archive in the process. We’re currently working on a post on Ebony Patterson. My favourite – ‘Banana Plantation’ -CLASSIC! Everytime i read this article about my grandfather it shows me how determined he was to succeed throughout each adversity he encountared (surly a true Jamaican). The pictures of the paintings and carving brings back vivid memories of my childhood days being around them and my grandma, not knowing then that one day the paintings and carvings would be amoung Jamaicas rich art and cultural history. What an excellent writing. Thank you. I would love to know if there are any book/(s) written about John Dunkley, (solely) I am trying to find one. Also, I would love to know if there are more resources about him. Is there a catalogue of the paintings/drawings with his work? I am a direct decedent of his and it would mean EVERYTHING to be able to get my hands on more information about my great grandfather. Thank you for your help in this venture. my name is carlos g dunkley i am from panama, my father born in 1920 his name was eduardo dunkley mantek, and my grand father name was charles ewdard dunkley,i want to know if jhon dunkley are family of us. thank you. Dear Mr Archambeau, thank you for your email. 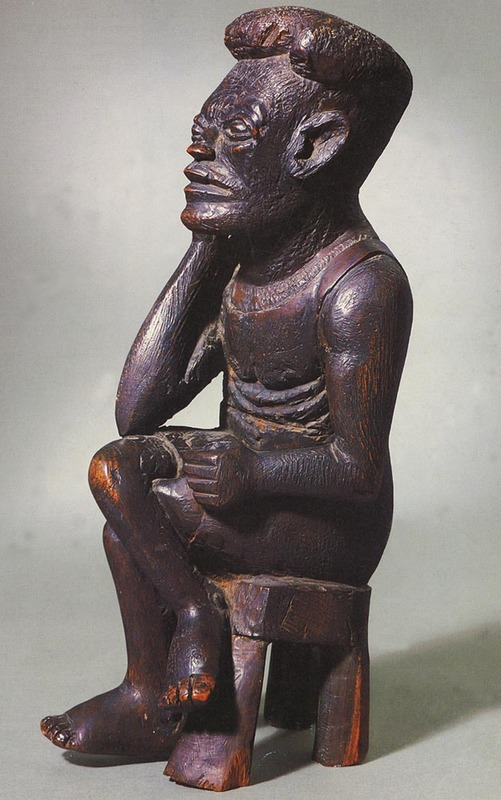 While not directly related to art, or John Dunkley, we are in effect aware of the work of Herbert Theodore Thomas, particularly on Obeah, and our Executive Director has done research on art and Obeah in which Inspector Thomas is actually mentioned, with an article forthcoming. There is also a recent book, Obeah and Other Powers, edited by Diana Paton, in which his activities are discussed in at leas one chapter. Google-User Pages Info on Jamaican Police Inspector Herbert T. Thomas. With my thanks to The National Gallery of Jamaica. Gerald. Thank you very much for taking the time to research my grandfather’s contribution to Jamaica’s history in the John Dunkley web site. His Pamphlet: “Something about Obeah” by Inspector H.T. Thomas was first seen at the first Jamaica Exhibition in 1891 and is still available from Columbia University Call #: 1341 [UTS] MRL Pamphlets. he is also in the Who’s Who in Jamaica 1916 . with my Thanks, Gerald.